With the launch of GSLV-MK III, slated for April, it will be able to cater to bigger satellites as well. Nikita Puri reports. Some weeks ago, images from the Satish Dhawan Space Centre, Sriharikota, made headlines across the globe. 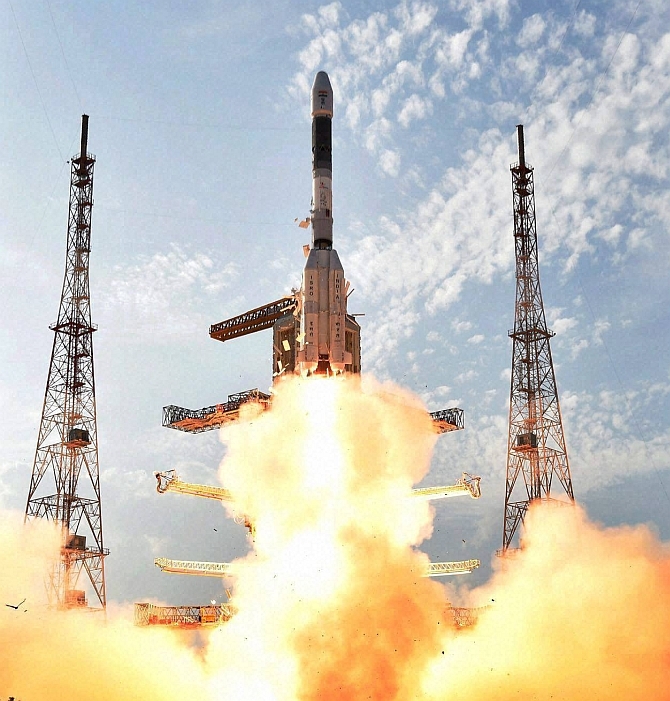 With the launch of 104 satellites in a single flight, Indian Space Research Organisation’s reliable Polar Satellite Launch Vehicle, in its 39th flight, made a record-breaking move: the PSLV-C37 carried into orbit satellites nearly three times the number seen in past missions. Prior to this, Russia's Dnepr rocket had carried 37 payloads in June 2014. But breaking Russia's record wasn't India's target. The idea was, in the words of ISRO Chairman A S Kiran Kumar, "to make optimum use of our capacity". ISRO's primary agenda was to launch a 730-kg satellite along with two smaller ones which weighed about 19 kg together. But it still had additional space for 600 kg. So, 101 foreign satellites were added to PSLV-C37's payload. This addition was an innovative solution in a time when the market for small and nano-satellites is booming. Over 3,000 small and micro satellites weighing between one kg and 50 kg are expected to be built and launched by various players in the next five years, according to SpaceWorks Inc, a US space industry researcher. "Besides academic universities and private companies based abroad, the demand also comes from smaller countries," says Ajey Lele, senior fellow at the Institute for Defence Studies Analyses. In case of last week's launch, for instance, there were 96 satellites from the US (88 from a company called Planet Labs), and one each from the Netherlands, Switzerland, Israel, Kazakhstan, and UAE. By acting as a launch pad for foreign satellites, significant revenue has flown into Antrix Corporation, ISRO's commercial arm. In 2015-16, Antrix's commercial launches amounted to Rs 230 crore, which was 4 per cent of ISRO's average spending over the previous three years. For Antrix, the revenue from last year is only 0.6 per cent of the global market, according to data shared in the Lok Sabha in July 2016, but that doesn't undercut the fact that hosting foreign satellites has aided ISRO. Though the exact amount ISRO earned from overseas customers for launching 101 satellites is still under wraps, "roughly half of our cost will be covered by the foreign satellites," Kiran Kumar has said. "Antrix's growing revenue is a respectable amount and the launch of 104 satellites is a significant milestone," says G Madhavan Nair, former chairman. The primary reason for foreign companies to look at ISRO, Nair says, is that "our programmes are very cost-effective and are drawn up on shoe-string budgets when compared to other international players." Besides, the pedigree of launch vehicles also comes into play here: developed in 1994, PSLV has proved a reliable partner with a good track record. Though India's share in the global market is still fairly small, the strides ISRO has made are fairly significant. For almost a decade, around the time that the Indo-US nuclear deal was being discussed, India was under a technological apartheid. "Neither was technology transferred to India, nor was Indian technology being used by international players close to the US," recalls Lele. This embargo was lifted only about six years ago. And then, when ISRO was building up an international portfolio by attracting foreign clients, controversy hit home in 2011. Two investigating panels found procedural lapses and lack of transparency in a deal signed between Antrix and Bengaluru's Devas, a satellite-based multimedia company, in 2005. Before this, the only time India's premier space research agency was in a public controversy was when two of its scientists were accused of espionage in 1994. The accusations, later investigations showed, were false. Fast forward to present: the total number of foreign customer satellites launched by PSLV now stands at 180. And while it may take some time for ISRO to actually make a dent in the commercial market, its mandate, like that of NASA, isn't really to make profits. "ISRO is not competing with private companies like SpaceX, and let's be very clear about that," says Lele. "It (SpaceX) may have made significant strides in space technology, but it is here purely for commercial reasons." In contrast, ISRO's purpose is to develop space and remote-sensing technology for social and national development. Even in the past, Kiran Kumar has stressed on ISRO's commitment to "enable the Indian space ecosystem." ISRO is working on creating a larger role for private companies. "We are coming up with approaches and encouraging the private operators to acquire (satellites and transponders)," Kiran Kumar says, referring to a policy change which is expected to pan out in the future. It has already contracted a consortium led by Alpha Design to build two Navic navigation satellites and plans to transfer satellite-making technology to the team. It is also hand-holding a consortium of private players to build a PSLV rocket by 2020. Even as the talk of transferring ISRO's technology to players in the private space continues, there is also the need for the space agency to work on the technology for heavy launches. "When we look at it from a business perspective, launching of only nano-satellites will not allow for any major revenue generation, there’s a need to launch bigger satellites too," says Lele. While PSLVs are used to deliver satellites to lower orbits (600-900 km), a Geosynchronous Satellite Launch Vehicle, or GSLV, is designed to take heavier communication satellites into geostationary orbits (about 36,000 km). Currently, ISRO has a certified launcher to carry two tonne satellites into space with GSLV-Mk II which has an indigenous cryogenic engine. But even this two tonne carrier is small: the need of the hour is a vehicle which can carry more payload. The next major event the world will closely follow is the launch of GSLV Mk III, expected in April. "Once the GSLV Mk III comes into play, ISRO will be able to carry about four tonnes into the orbit. This will automatically increase the client base for Antrix," says Nair. The same rocket, once it is proven, will also be used for India's first manned space flight. But it will take a few successful launches before the GSLV gains the reputation of being reliable, feels Lele. "People need to develop a level of confidence in your rocket technology. As far as PSLV is concerned, people have confidence. But when we talk about the GSLV vehicle, we still aren't there,” he says. The task is clearly cut out for ISRO: it needs to extend the confidence PSLV's success has inspired to its newer technologies -- in this case, a heavier rocket in GSLV.